Thanks to Peter for alerting me to an ongoing crisis. The Diario reports an Air Astana passenger plane which had just been repaired has lost its instruments during a flight from Alverca and is flying over the greater Lisbon area and Ribatejo, while authorities decide how it can best make landfall. Authorities are evaluating the situation to figure out how to safely land the aircraft,and an Air Force source says that two F 16 aircraft have been deployed to follow the aircraft, which will be an Air Company’s Embraer Astana. On board are the two pilots, who gave warning to the failure in the instruments of flight. NAV, the Portuguese air navigation agency, has also confirmed to CM that there is a “declared emergency situation”, but it does not reveal further details. The plane will be flying over the area of ​​Salvaterra de Magos. 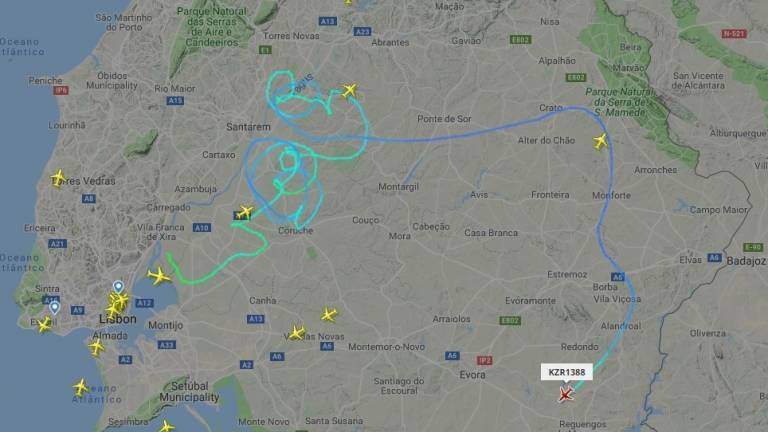 The Flight Radar website shows the aircraft’s erratic trajectory over the Ribatejo skies. More public procurement violations. Armistice Day. Pilots can fly under VAR- Visual Flight Rules. Beacon lights, approach lights and runway lights help the pilots reach the runway.